How far is Ben Nevis from Cedar Lodge? As you can see from the photos above, Ben Nevis is very close by. Some guests walk from Woodside, but most travel to the Glen Nevis Visitor Centre or Achintee Farmhouse in Glen Nevis, to start their walk up the mountain. Glen Nevis is less than 10 minutes by car. What about the weather for climbing Ben Nevis? Mountains create their own climates and when its very wet and windy, we would not recommend attempting to reach the summit. You would see nothing and the experience could be frightening. There are several lower-level walks which we recommend and these are often very enjoyable and rewarding. It snows on the mountains here from late September to late May, although it can snow on the summit of Ben Nevis on any day of the year. From November onwards expect deep snow near the summit during cold periods. You can check the weather at Ben Nevis by keeping an eye on our Ben Nevis WebCam. Do we take dogs or cats? No, we prefer cash or cheques. Seriously, we have nothing against pets, but don’t allow them in our house. It takes too much time and effort to clean up afterwards for our next guests, who may not like dogs (or cats). You can bring one well-behaved dog if it will sleep in your vehicle at night and you are responsible for its toilet. Can you smoke inside the property? No way! If you smoke, best thing to do is go for a short walk along our quiet country road. Yes we do – PROVIDED they are extremely well-behaved, they are supervised by a responsible adult at all times, don’t jump up and down on the beds, run back and forwards through the house, paint on the walls………… we have a large garden deck with swings and a slide, and a play house, and a sand pit. How far is Fort William town centre? 3.5 miles – 10 minutes by car or taxi and 20 minutes by bicycle. There’s a BP filling station 2 miles from us which stocks milk, bread, newspapers etc. Its open 24 hours. A pleasant 15 minute walk on a cycle path. What midges ? We have a large midge-catcher and so too do our neighbours, so we don’t have a midge problem. Midges are mostly an issue when its calm and humid – a slight breeze carries them off somewhere else..
Where is the nearest pub for good food and beer? 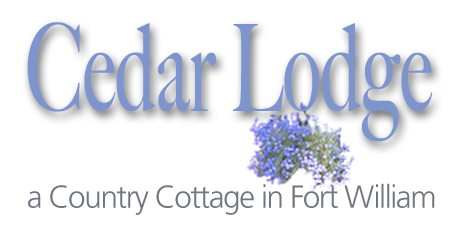 Mosts places to eat and drink are all a short drive from Cedar Lodge in town – we are happy to recommend quite a lot, but none of them are in walking distance as our local “country pub” is a bit of an enigma and mostly closed. Can’t think of anything else at the moment – if you have a big request – ask away – we’ll consider anything reasonable.